Brookdale Cape Coral was a much older facility and not very clean. The staff was very good. There were studios and apartments that were much smaller, older, and needed updating. They had a courtyard that also needed some upkeep. Their dining area was one big table. There were only 13 residents there, so it's a very small facility. Brookdale Cape Coral seemed to be not what they intended it to be. I hardly saw any of the residents, and the staff hardly saw any of them either. It was a new facility and they had a calendar of events that they were supposed to do, but they didn't seem to be following any type of activities with the residents there. A couple of weeks later, we saw in the news that they had a bedbug infestation there. They made a lot of excuses for not having activities. The best way to get to know a community is by scheduling a tour. 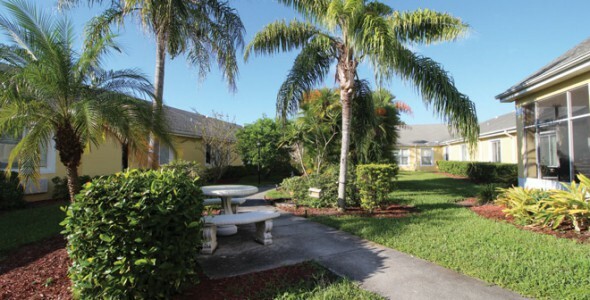 See the facilities, meet the staff and residents, and get a feel first hand what it's like to live at Brookdale Cape Coral Assisted Living. The sun-soaked town of Cape Coral is the perfect setting for Brookdale Cape Coral (formerly Sterling House of Cape Coral), where we offer personalized assisted living for seniors who need a little extra help yet still desire rich and full lives. Minutes from shopping, restaurants and Cape Coral Hospital, our inviting and cheerful community offers the best in both convenience and comfort. Brookdale Cape Coral is proud to be a part of Brookdale. Since 1978, Brookdale has been dedicated to enriching the lives of seniors with compassion, respect and integrity. Brookdale Cape Coral features attractive private or companion apartments that come in a variety of floor plans. Our spacious units include kitchenettes and private baths with step-in shower. We also warmly welcome small pets. Our cozy community offers beautifully decorated common areas that are reminiscent of a private home. Residents can gather in our recreation and family rooms for community discussions and crafts, a fireside chat or a hand of bridge. Outside, they can tend to favorite plants in the garden. On cooler or rainy days, our sun room is a contemplative spot to relax with a book or entertain visitors. The staff at Brookdale Cape Coral partner with residents to design a personalized service plan that meets their changing needs. We assist residents with daily living activities such as bathing and dressing, all in the privacy of their apartments. Housekeeping and linen services are provided, as well as continuous health monitoring and a continence management program. Our elegant dining room is the perfect setting for our enticing menu of superbly prepared meals, prepared three times daily by our master chef. Staff are on hand for dining assistance if needed. We invite you to learn more about Brookdale Cape Coral, a quality assisted care community where we take pride in serving our residents with integrity and respect.